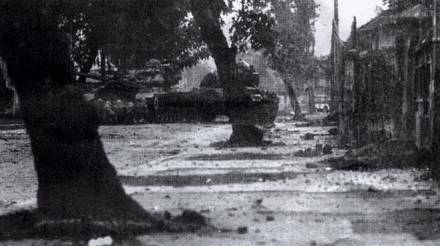 At 03:40 on the foggy morning of 31 January, allied defensive positions north of the Perfume River in the city of Hue were mortared and rocketed and then attacked by two battalions of the 6th PAVN Regiment. 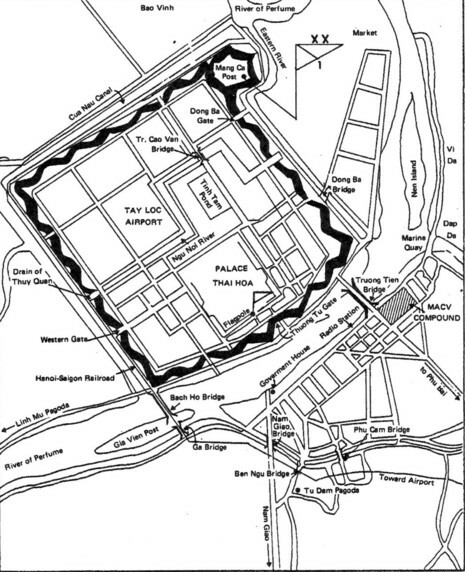 Their target was the ARVN 1st Division headquarters located in the Citadel, a three-square mile complex of palaces, parks, and residences, which were surrounded by a moat and a massive earth and masonry fortress built at the beginning of the 19th century by Emperor Gia Long. The undermanned ARVN defenders, led by General Ngo Quang Truong, managed to hold their position, but the majority of the Citadel fell to the communists. On the south bank of the river, the 4th PAVN Regiment attempted to seize the local MACV headquarters, but was held at bay by a makeshift force of approximately 200 Americans. The rest of the city was overrun by communist forces which initially totaled approximately 7,500 men. Both sides then rushed to reinforce and resupply their forces. Lasting 25 days, the battle of Huế became one of the longest and bloodiest single battles of the Vietnam War. During the first days of the North Vietnamese occupation, allied intelligence vastly underestimated the number of communist troops and little appreciated the effort that was going to be necessary to evict them. 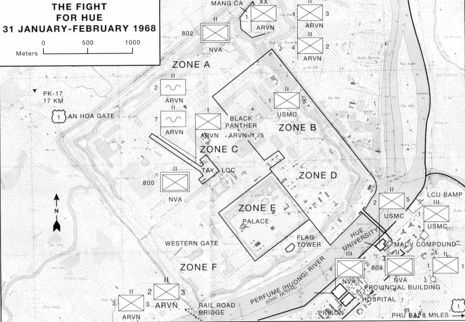 General Westmoreland informed the Joint Chiefs that "the enemy has approximately three companies in the Hue Citadel and the marines have sent a battalion into the area to clear them out." 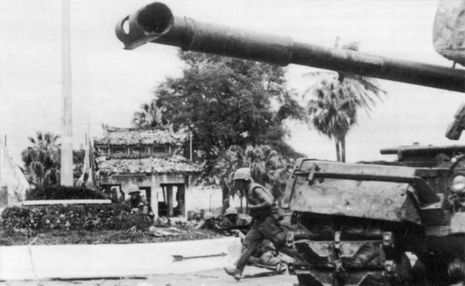 Since there were no U.S. formations stationed in Hue, relief forces had to move up from Phu Bai, eight kilometers to the southeast. In a misty drizzle, U.S. Marines of the 1st Marine Division and soldiers of the 1st ARVN Division and Marine Corps cleared the city street by street and house by house, a deadly and destructive form of urban combat that the U.S. military had not engaged in since the Battle of Seoul during the Korean War, and for which its men were not trained. Because of the historical and cultural significance of the city, American forces did not immediately apply air and artillery strikes as widely as it had in other cities. Outside Hue, elements of the U.S. 1st Air Cavalry Division and the 101st Airborne Division fought to seal communist access and cut off their lines of supply and reinforcement. By this point in the battle 16 to 18 communist battalions (8,000-11,000 men) were taking part in the fighting for the city itself or the approaches to the former imperial capital. Two of the North Vietnamese regiments had made a forced march from the vicinity of Khe Sanh to Hue in order to participate. During most of February, the allies gradually fought their way towards the Citadel, which was only taken after four days of intense struggle. 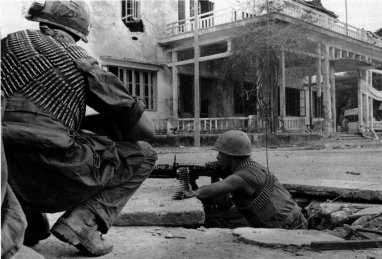 The city was not declared recaptured by U.S. and ARVN forces until 24 February, when members of the 2nd Battalion, 3rd Regiment, 1st ARVN Division raised the South Vietnamese flag over the Palace of Perfect Peace. 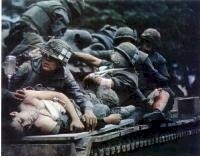 During the intense action, the allies estimated that North Vietnamese forces had between 2,500 and 5,000 killed and 89 captured in the city and in the surrounding area. 216 U.S. Marines and soldiers had been killed during the fighting and 1,609 were wounded. 421 ARVN troops were killed, another 2,123 were wounded, and 31 were missing. More than 5,800 civilians had lost their lives during the battle and 116,000 were left homeless out of an original population of 140,000. In the aftermath of the recapture of the city, the discovery of several mass graves (the last of which were uncovered in 1970) of South Vietnamese citizens of Hue sparked a controversy that has not diminished with time. The victims had either been clubbed or shot to death or simply buried alive. The official allied explanation was that during their initial occupation of the city, the communists had quickly begun to systematically round up (under the guise of re-education) and then execute as many as 2,800 South Vietnamese civilians that they believed to be potentially hostile to communist control. Those taken into custody included South Vietnamese military personnel, present and former government officials, local civil servants, teachers, policemen, and religious figures. Historian Gunther Lewy claimed that a captured Viet Cong document stated that the communists had "eliminated 1,892 administrative personnel, 38 policemen, 790 tyrants." This thesis achieved wide credence at the time, but the Massacre at Huế came under increasing press scrutiny later, when press reports exposed that South Vietnamese "revenge squads" had also been at work in the aftermath of the battle, searching out and executing citizens that had supported the communist occupation. The North Vietnamese later further muddied the waters by stating that their forces had indeed rounded up "reactionary" captives for transport to the North, but that local commanders, under battlefield exigencies, had executed them for expediency's sake. General Truong, commander of the 1st ARVN Division and hero of the battle, believed that the captives had been executed by the communists in order to protect the identities of members of the local Viet Cong infrastructure, whose covers had been blown. The fate of those citizens of Hue discovered in the mass graves will probably never be known with certainty, but it was probably the result of a combination of all of the above circumstances. In the early morning hours of 31 January 1968, a division-sized force of North Vietnamese Army (NVA) and Viet Cong (VC) soldiers launched a well coordinated multi-pronged attack on the city of Hué. 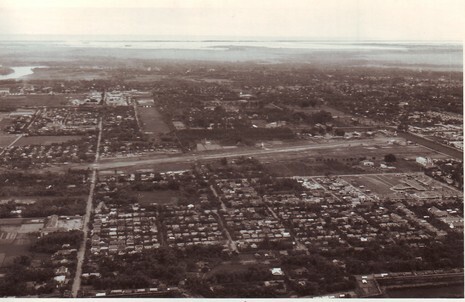 Their targets were the Tay Loc airfield and the 1st ARVN Division headquarters in the Citadel, and the MACV compound in the New City on the south side of the river. Their strategic objective, however, was to "liberate" the entire city as part of a country-wide popular uprising to sweep the Communist insurgents into power.